Do you dream of leather? 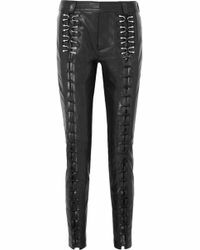 Channel your inner biker and invest in a serious pair of lace-up pants. 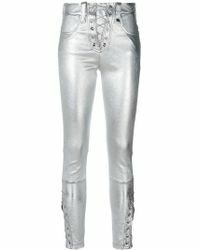 Go all-out Vamp like Bella Hadid with a pair of top-to-bottom lace-up Unravel leather pants or simple stick your toe in the water with a pair of embellished trim Just Cavalli skinny pants. Whatever you choose, make sure you add heels and some seriously dark lipstick for a statement look that'll get you noticed in all the right ways.